While the merits of vouchers have been the subject of intense public debate in recent years, there has been very little available evidence upon which to gauge their efficacy. The first publicly funded voucher plan involving private schools wasn't established until 1990 in Milwaukee; before then, the only data on school choice came from a small, poorly designed program in California. Voucher programs grew dramatically in the latter half of the 1990s. In 2000, about 60,000 students participated in seventy-one programs, most privately funded. 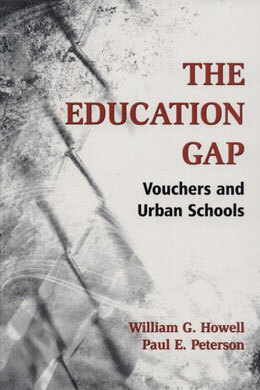 This growth is now providing researchers with the ability to measure the impact of vouchers for the first time in multiple cities.The Education Gap is the first book to gather a significant body of data on vouchers in multiple locations, and it reveals startling new evidence that voucher programs benefit African-American students more than participants from other ethnic groups. To explain this phenomenon, the authors point out that residential selection is the most common form of school choice available in American public education today. Since this process is likely to leave African Americans in the worst public schools, new forms of choice directed toward low-income families are most likely to benefit black students.The authors examine the effects of school vouchers on test scores, parental satisfaction, parent-school communications, and political tolerance among students and parents participating in four pilot programs in New York City; Dayton, Ohio; Washington, D.C.; the Edgewood school district in San Antonio; and a program that offered vouchers to 40,000 low-income families nationwide. Though the programs operated in a wide variety of settings, the findings were surprisingly consistent. After two years, African-American students who used vouchers to switch from public to private schools scored substantially better on math and reading tests. By contrast, no significant positive effects on the test scores of other ethnic groups were detected. While parents in all ethnic groups were generally more supportive of private education, African-American parents expressed particularly high enthusiasm for the private schools their children attended. The authors also report information on the kinds of students and families who take advantage of a voucher opportunity, allowing them to seewhether only the ¡°best and brightest¡± public school students were able to take advantage of school voucher programs. The results documented in The Education Gap shed new light on the effects of school vouchers on students in poor, urban environments. This information will be important to policymakers, scholars, and citizens are they continue to search for ways to improve education in urban areas.